SAO PAULO, Brazil. 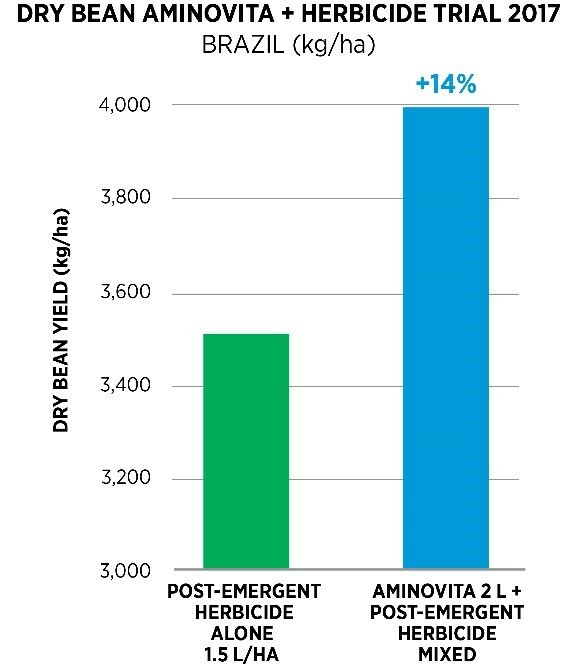 (January 22, 2019)—Results from recent field trials in Rio Paranaiba, Brazil demonstrate significant yield improvement on dry beans treated with HYT™ B AminoVita® in combination with a post-emergent herbicide. The trial results showed that using AminoVita with a post-emergent herbicide resulted in a 14 percent yield increase compared to test plots treated with a post-emergent herbicide alone. In the Brazil field trials, AminoVita was applied at two liters per hectare mixed with a post-emergent herbicide at 1.5 liters per hectare. The combination was sprayed broadcast in 200 liters of water per hectare when beans where in the V3 – V4 growth stage. In the control test plot, a post-emergent herbicide alone was applied at 1.5 liters per hectare and sprayed broadcast in 200 liters of water per hectare during the same V3 – V4 growth stage. The plot treated with AminoVita in combination with a post-emergent herbicide produced a yield increase of 504 kg/ha compared to the control plot, representing a 14 percent yield increase. The trials were administered by third-party research firm IPACER. AminoVita is a unique foliar nutrient solution produced by microbial fermentation. The nutrients found in AminoVita, including carbon, nitrogen, true protein, free amino acids and other micro-nutrients, are essential to plant development. Foliar applications of AminoVita enhance crop tolerance to environmental and physiological stresses. Growers using Agrinos products in Brazil have experienced improved crop health and yield increases. Through its scientific formulation and proprietary co-fermentation process, Agrinos has created a robust platform of biofertilizer products with a complex blend of critical nutrients. When applied, these products can create an environment favorable for plant growth in both ideal and harsh conditions.